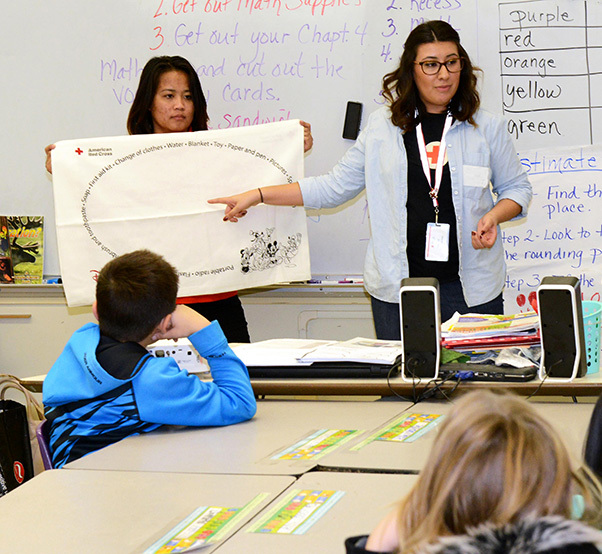 American Red Cross volunteers Cecilia Olivas (center) and Simone Delaflor Evangelista talk to fourth graders at Irving L. Branch Elementary Jan. 19, 2017, about the Red Cross’ Pillowcase Project. 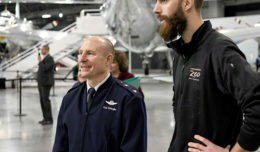 The project encourages third-fifth-graders to learn about emergency preparedness. The Edwards Office of Emergency Management, 812th Civil Engineering Squadron, invited the American Red Cross to Irving L. Branch Elementary Jan. 19, 2017, as part of the Red Cross’ Pillowcase Project. Branch fourth-graders received a lesson in emergency preparedness with encouragement to take what they learned back to their families. 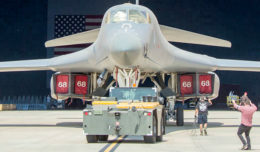 The Pillowcase Project is sponsored by The Walt Disney Company, which allows Red Cross volunteers to visit third-fifth-graders around the region bringing them information and preparedness tools. The students each received a preparedness toolkit, which includes a “My Preparedness Workbook” and a personalized pillowcase to build their personal emergency supplies kit. The children are able to put items in the pillow case they may need during an emergency as well as draw pictures of items and people on the outside. They also received a pledge certificate and an Air Force “Be Ready Kids!” activity book from Edwards AFB Emergency Management. 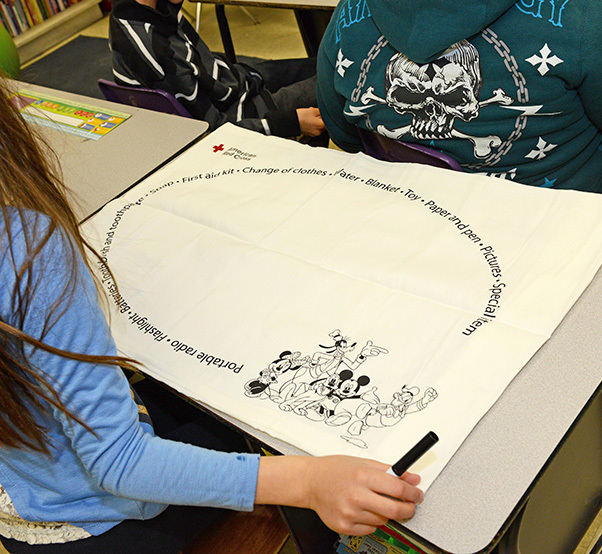 As part of the American Red Cross’ Pillowcase Project sponsored by The Walt Disney Company, students are given a pillowcase to carry their emergency supplies and the opportunity to draw pictures on the outside of supplies and items they would like to take with them. Edwards Emergency Management also provided an Air Force “Be Ready Kids!” activity book. Red Cross volunteers visited Irving L. Branch Elementary Jan. 19, 2017. The one-hour sessions with the Red Cross volunteers and students were interactive, with the visitors calling upon the students to talk about what they know about emergencies and what they learned during the class. Subjects touched on by the volunteers included managing stress during an emergency; what to do in case of a fire or earthquake; and what items the children should pack during an emergency. According to the Red Cross, more than 515,000 students have been taught preparedness skills through the Pillowcase Project. 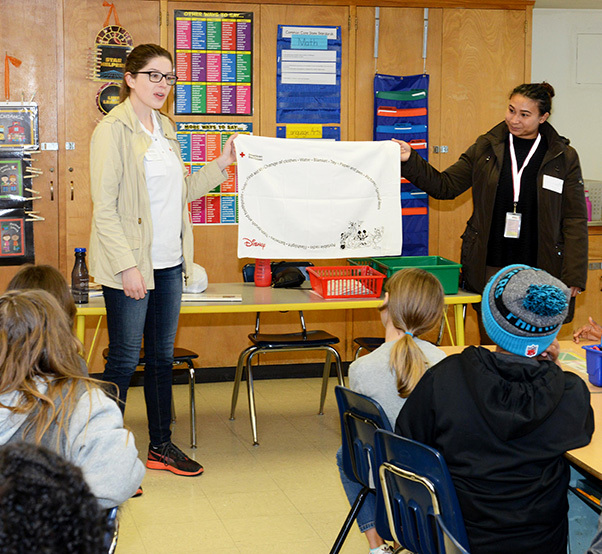 American Red Cross volunteers Haley Seibel (left) and Tamara Alcantara talk to fourth-graders at Irving L. Branch Elementary Jan. 19, 2017, about the Red Cross’ Pillowcase Project. Subjects touched on by the volunteers included managing stress during an emergency; what to do in case of a fire or earthquake; and what items the children should pack during an emergency in their pillowcase.